Google Maps' new layer, tellingly called Black Marble, reveals the glow of cities and tiny specks of village lights lining up the contours of land masses -- and then there are the lights on the sea, lighting up the ocean night skies to attract fish. As it turns out, Black Marble is a mine of information on the extent of fishing in the Philippines. WWF's Tuna Strategy Leader Dr Jose Ingles investigates. A new layer of maps for Google Earth was made available, called the Black Marble: a composite view of Earth’s lights taken by a Suomi National Polar Orbiting (SNPO) Satellite from 824 km above. The night lights of 2012 were taken during 9 moonless days in April and 13 days of October. It took 312 orbits of the SNPO satellite to cover every land and island on the planet, generating 2.5 terabytes of data that was plotted as a layer to the blue marble map. Viewing in awe the city lights, tiny specks of village lights lining up the contours of land masses, I realized that the map likewise captured lights on the sea. These were mainly fishing fleets, lighting up the ocean night skies to attract fish--although the lights from oil platforms are highly visible as well. Many of the light fishing locations are near islands, coasts and quite distinctly, many are within the 15 km zone that is off limits to commercial-scale fishing. For the Philippines, the most visible lights were observed along North, Western and Northeast Palawan, in between major islands and passages. These are purse seine boats targeting round scads, bigeye scads and squids. 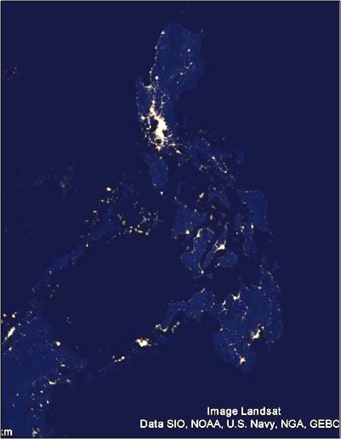 Surprisingly, the brightest lights were observed along the Sulu Archipelago, between the islands of Basilan and Sulu, and north-east of the Tawi Tawi group of islands. These are purse seine and ring net boats targeting sardines. The entrance to Manila Bay is flooded with lights that extend up to Subic Bay. These are probably purse seine and ring net fleet vessels as well. There were faint lights scattered over the hotly contested Spratly Islands, despite the on-going territorial disputes. Light fishing does not happen in the middle of large bodies of water such as the Sulu and Celebes seas, although some lights were observed in the middle. 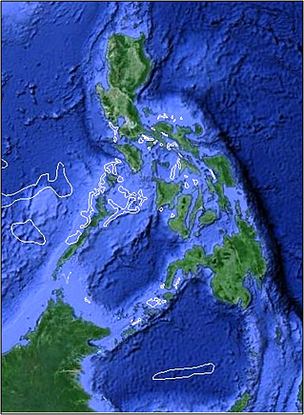 In the Philippines, light fishing is used in conjunction with Fish Aggregating Devices (FADs). Boats with powerful lights (producing between 2000-5000 watts) attract the catch, and then detach from the FAD to drift together with the fish. Meanwhile, the “catcher” vessel, once clear of the anchored FADs will start the encircling and brailing of the catch. What is exciting is that such maps can be used to visualize the extent of night fishing in the country. They provide approximate distances of their location with respect to existing laws on fishing areas and jurisdictions. As the cost of acquiring these satellite data decreases, their use in fisheries management is a welcome development. It provides an accurate, almost real time set of information that may be used in fisheries management, in marine spatial planning and in monitoring the movement of fishing fleets as they follow the movement and occurrence of certain species of fish.